Another week, and we're spinning the dual-control combination lock once again to gain access to SampleRadar's vault of high-quality, royalty-free samples. The collection we're giving you here has a distinctly French flavour, being inspired by the likes of Kavinsky, Justice, Mr Oizo and the artists on the Kitsuné label. 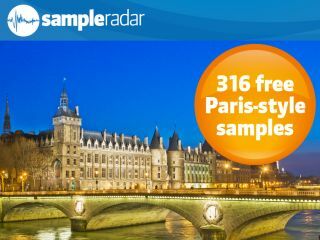 Download it and give your music a sense of Parisian style - you'd be 'in-Seine' to miss out! The samples are split into six folders, each of which contains a construction kit of samples at a specific tempo. As well as loops, some of the kits also contain hits. The Parisian-style samples are supplied in a zip file, so you'll need to extract them before you can see them. Enjoy!